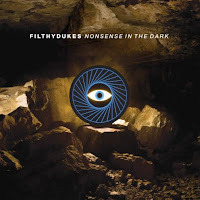 It seems like ages ago, but in August last year I wrote about Filthy Dukes when their first single This Rhythm was doing the rounds and over a month since their album Nonsense in the Dark came out I finally bought my copy. And it's one of the albums of the year. Pet Shop Boys' Yes, Royksopp's Junior and now this. Olly, Tim and Mark - DJs and producer turned band - have achieved a cohesive collection of songs with entrails dipped in influences from dance to synthpop via indie. An embarrassment of riches. The all-seeing eye album is all-conquering at the moment because of the major future single Messages featuring Swede Tommy Sparks on vocals. Olly explains in the vid below that it was the one track on the album they weren't sure about: "We loved it but it scared us that it was so poppy. When Tommy first wrote the chorus and sent it back to us we just thought, blimey, that's a big pop record". And Mark praised the pop genius behind it: "I think his talent, like all Swedes have, is the ability to write pop hooks and as soon as he came into the studio he nailed that in record time." Watch this Channel 4 4Play doc below. It's an excellent introduction to the band as they talk about the making of the album and the other collaborations. The singers and co-writers involved in Filthy Dukes' debut album are inspired. 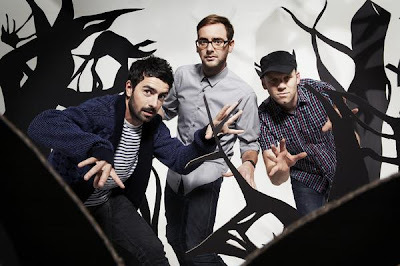 Like The Chemical Brothers, the trio have an innate knack to fit a voice to their sound. No one is shoehorned in. For instance, on Elevator, which sounds like early Human League, there is a vocalist called Jack Snape from a To My Boy who sounds very like Phil Oakey, especially when singing the "Elevator" line. Brandon Curtis of US rock band Secret Machines speaks of being able to latch onto the New Order-type "Sad and heroic qualities" in two of my favourite tracks Light Skips Cross Heart and Don't Fall Softly, writing lyrics for the former and singing on the latter. Listen to them below. For a great track-by-track interview, go here to Gigwise. Go buy Nonsense in the Dark here in the UK and here in the US. Below is the second single, out at the end of last year, Tupac Robot Club Rock. Want to thank you for turning me on to this album. AMAZING. Bought an import CD for $23 and had shipped to the US--WORTH EVERY PENNY. Faves--Elevator, Messages, Nonsense in the Dark, Light Skips Across Heart, Poison the Ivy, and Somewhere at Sea, but ALL OF IT, really! countpopula, isn't it great to have a WHOLE album to listen to and enjoy? They worked really hard on this record and it's paid off. Right on Phil. I am a firm believer that, if an artist puts some amount of time and effort into creating a full project worthy of the attention, it should be paid for in full. If we don't support music and the artists more, we'll have nothing but crap singles left (shudders). I know there aren't as many truly great albums being made as there used to be, but this was really up there for me. Thanks again! Just checking out the Adventures too. Where was I?